It seems as if the whole world is going electric, with demand for charging stations for EVs (electric vehicles) now far outstripping supply. In fact, 2017 was named as the ‘tipping point’ for these types of cars, a year in which the commodities required for EV production increased markedly in value. At Peter Vardy we wanted to find out more about the impact of this ongoing EV revolution, which is why we conducted a study looking at as many aspects of it as possible. Currently, around 100,000 vehicles in the UK are either fully electric or plug-in hybrids. But this number is set to swell. Experts say that there will be 40 million EVs in the UK by 2040, with some estimating that the additional electricity required will be the equivalent of ten new nuclear power stations – or more than 10% of the country’s existing power. The UK government recently pledged £540m in support of low-emission vehicles, with £400m of this amount dedicated to charging infrastructure projects across the country. There is also a Plug-In Car Grant available to cover up to 35% of the cost of a low-emission car or up to 20% of the cost of a van. 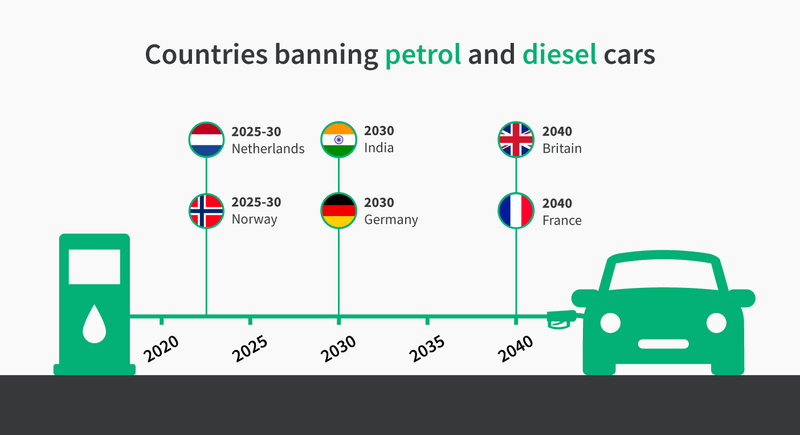 In line with these announcements, China has also pledged to ban petrol and diesel vehicles. Other countries are certain to follow suit, meaning that by 2040 at the latest, a large proportion of roads across the world will be entirely electric. It’s easy to see why so many countries are officially embracing EVs. They offer lower running costs than traditional vehicles and, crucially, are kinder to the environment. A recent study shows that the greenhouse gasses and other emissions from EVs are vastly lower than those produced by traditional vehicles. Many motorists also consider EVs to be easier to drive and run. Initially, these vehicles can be expensive, with entry level prices of around £15k, growing to £30k for a mid-range EV and rising to over £100k for a top-of-the-line model. Running an EV could also add about £175 per year to an average electricity bill – with this reduced by up to 49% by smart charging – but this compares favourably to the £800 required to run most traditional vehicles. Plus, with the Plug-In Car Grant, EVs could be even more affordable. When it comes to MOTs, electric cars require checks every three years, as traditional vehicles do. The difference is that they do not need to be tested for emissions. This is potentially another area in which electric vehicles can save their drivers time and money. BP has announced that it will install charging points at petrol stations across the UK. Similarly, Shell has doubled it’s spending on clean power as part of an ongoing commitment to green energy and it promises to halve its carbon footprint by 2050. The UK government will invest £1.5bn by 2020 in ensuring that new homes and lampposts offer electric charging. It also says it will invest more than £800m in driverless and clean technology, with an additional £246m to be spent on research into battery technology. Other countries, such as Japan (which is focusing on hydrogen fuel cells), are adopting similar stances. In the private sector there are said to be vast profits awaiting those able to invest. Grand View Research estimates that the global lithium-ion battery market is expected to be worth $93.1bn by 2025. While Morgan Stanley expects global car sales to rise to 130m units a year by 2050, with electric vehicles accounting for 47% of that. 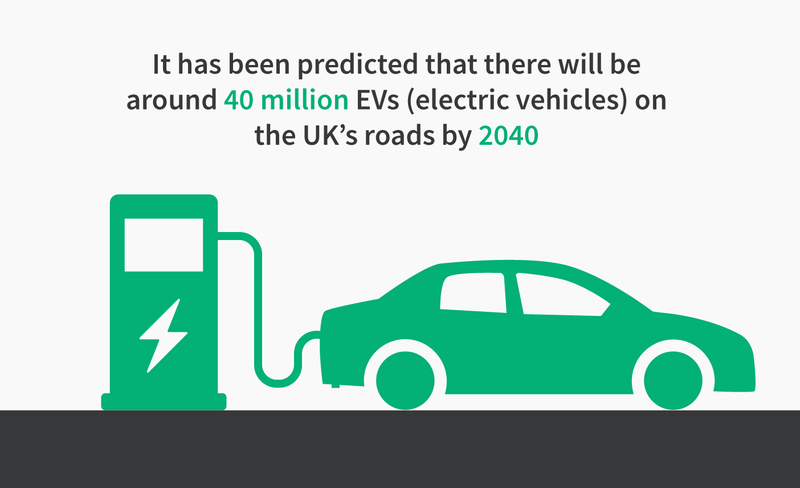 Their estimate is that a total of one billion EVs will be on roads worldwide. When it comes to what’s used in production processes, the makers of EVs no doubt have their sights set on greener alternatives. BMW already plans to use discarded ocean plastic in its newer vehicles. There are even plans to create wired roads, offering Dynamic Inductive Charging, that can charge EVs while they are driven. This will save time as well as money, as batteries which are recharged frequently tend to last longer. If electric vehicles are charged on the move the entire nation would avoid peaks in power demand, such as the after-work surge at around 6pm. According to the National Grid, demand for electric car charging at peak times could be as much as 8GW higher than usual. Electric vehicles bring with them plenty of advantages and much to think about. If you’re considering choosing one, it might be worth searching our selection of cars to find the EV that’s right for you.